Chrissy Teigen and John Legend Hilariously Play Charades Against Jimmy Fallon and Chelsea Handler -- Watch! When Laurel visits Hardy at home, hi-jinx occur and the Mrs. orders them out. They go to a golf course where they try to impress two young ladies and wind up in a mud-slinging fight with other golfers. Stan & Ollie attempt to fool their wives by sneaking out to a poker game, but instead get involved with two flirty ladies, one of whom is the girlfriend of a jealous boxer. Inexperienced waiters (Laurel & Hardy) are hired for a swank dinner party. Oliver inherits a fortune and hires Stan as his butler and proceeds to torment him. Stan finally rebels and goes on a rampage, destroying Oliver's fancy furnishings. Stan Laurel and Oliver Hardy were comedic geniuses, individually and together, and their partnership was deservedly iconic and one of the best there was. They left behind a large body of work, a vast majority of it being entertaining to classic comedy, at their best they were hilarious and their best efforts were great examples of how to do comedy without being juvenile or distasteful. 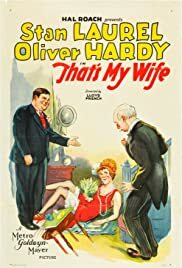 Although a vast majority of Laurel and Hardy's previous efforts ranged from above average to very good ('45 Minutes from Hollywood' being the only misfire and mainly worth seeing as a curiosity piece and for historical interest, and even that wasn't a complete mess), Along with 'Two Tars', 'Liberty' and 'Wrong Again', 'That's My Wife' is one of the best and funniest Laurel and Hardy short film up to this point of their output, one of their best from their overall early work and very nearly one of my personal favourites of theirs. Their filmography, apart from a few bumps along the way, was getting better and better and 'That's My Wife' exemplifies this. Slightly too slow to start with, but very quickly picks up and hardly anything to criticise here. Once again, 'That's My Wife' is non-stop funniness all the way, its best part being the riotous ending. There is insane craziness that doesn't get too silly, a wackiness that never loses its energy, the lack of vulgarity (despite that being the biggest traps of portraying female drag in comedy) that is a large part of 'That's My Wife's' memorability and the sly wit emerges here, some of the material may not be new but how it's executed actually feels fresh and it doesn't get repetitive. Laurel and Hardy are on top form here, both are well used, both have material worthy of them and they're equal rather than one being funnier than the other (before Laurel tended to be funnier and more interesting than Hardy, who tended to be underused). Their chemistry feels like a partnership here too, before you were yearning for more scenes with them together but in 'That's My Wife' we are far from robbed of that. 'That's My Wife' looks good visually, is full of energy and the direction gets the best out of the stars, is at ease with the material and doesn't let it get too busy or static. The supporting players are solid.